We are so happy and blessed to have found Silvia to photograph our wedding. She is so incredibly sweet on top of being so so talented and always professional. She was always easy to communicate with and very responsive. She even drove 50 miles in rush hour traffic to meet with us in person. We were just so impressed by her. Her love for photography really shines through when talking with her. My groom and I had never had photos done by a professional before but she never got frustrated by our lack of ability to do the poses and was so sweet, pleasant, patient, and helpful the whole time! Very accommodating and flexible and the images she creates are just beyond beautiful. I can't rave enough about Silvia!! Silvia is absolutely amazing! She strives to make sure she captures exactly what the couple wants for their pictures. She is the best! 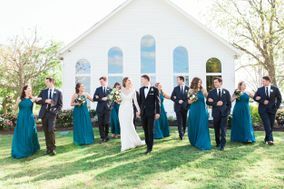 We were so impressed with Silvia's photography skills; while we were rushing to take photos between the ceremony and reception, the sun kept going in and out of the clouds. She was constantly having to adjust the lighting and switch between her cameras, and the pictures still turned out great! She asked good questions beforehand about what the wedding day would be like and did a good job of scouting out the area for good photo spots. She really worked with us to negotiate a price that worked for both of us, and she insisted to give us parts of the package that we didn't even think we wanted. She gave us even more pictures than we expected, so we have a big handful of pictures to choose from. Silvia did an excellent job! She worked really hard all day long to capture our wedding and she always had a smile on her face. She had a positive attitude even when things got stressful and I so admire her for that. She is also really flexible and helped the day go smoothly. I would absolutely recommend her!